I just love spring with the warmer temperatures and the beautiful ways that the earth renews life. I hope that you are enjoying the weather and season where you live. What is your favorite thing about the season you are in?? We went out of town for a few days to visit family and friends and a post that I had scheduled to go up earlier this week didn't make it, so I will have to re-post it for you in the next few days. 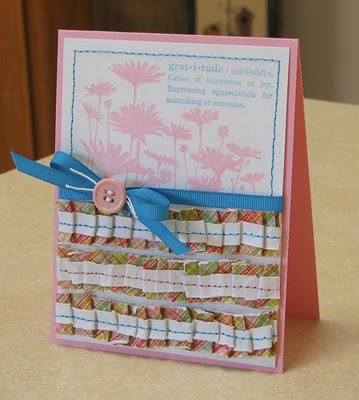 Right now, I have a card that I created with Kazan's Sketch 52 at 2 Sketches 4 You and the Moxie Fab Tuesday Trigger this week. I was inspired by the ruffles on the plates with the Tuesday Trigger as well as the colors and the daisy. Cardstock, stamps, ink, ribbon: Stampin' Up! Thanks for stopping by and as always thanks for your comments. This is so pretty! Great job!! Pretty card! Love your ruffled ribbon! love the pleated ribbon for detail! What a pretty take on the Trigger! I am lovin' those ruffles.... very pretty card! OMGosh, this is stunning! Love the design and the colors are just fab.